Luke Hughes was born in 1894 at Cheeseman’s Creek near Orange, the sixth child of Luke Hughes and Elizabeth Lidster Hughes. My father was the thirteenth child and born ten years later in 1904. By all accounts Luke had a fine disposition and was popular within the family and also the wider community. 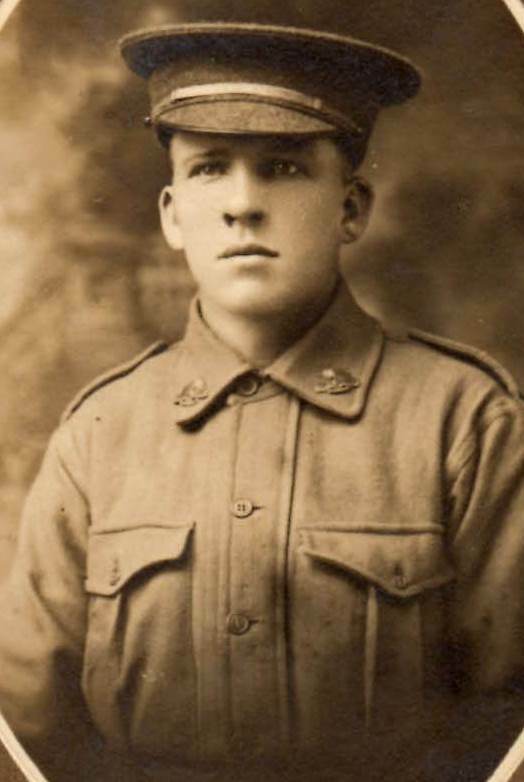 He enlisted in July 1915 and left Australia in October bound for Egypt where he was transferred to the 45th Battalion and sent to France. He was fatally shot by a sniper at Messines on 7 June 1917. The following letter was one he wrote to his mother. He mentions Hilltop which was the name of their farm at Penrith, George his brother serving in Egypt, the Stammers were his cousins and Ted, one of his younger siblings. At last I am a dinkum soldier. I have been in the firing line for nearly a week now and still on my feet, though old Fritz seems to think that I ought not to be here. He makes things lively now and again; he is having his evening strafe at present and this dugout is shaking from the concussion, some of his shells are only lobbing about 50 yards away. I am not very often in the front line as I am amongst the headquarters bombers. I have become quite an expert with the bombs and seven of us were picked out from a company, I am in command of the other six. I like this life better than in training, of course the risk of life is much more in evidence but that only goes to make life sweeter. I received your Messenger and thank you very much. Send more please for I love to read them, they do much to strengthen our courage especially in a time like this; you know how frightened I used to be of bees, well I am even more afraid of shells. The battlefield presents a wonderful sight. Ruins, nothing but ruins, even the poor harmless trees and hedges have suffered. There are the ruins of an old convent here, it was destroyed by the Huns in the Franco-Prussian War and further destroyed in this. It was the largest convent in the world in its time, parts of the gardens still exist and there are some lovely flowers in it. There are many graves around here, mostly British but not a few Germans were given decent burials by our men. It is not uncommon to see on the little wooden cross at the head of the grave (in honour of several German soldiers). I have not seen any gas attacks yet but there have been many alarms and I can tell you that my respirator was on in very quick time, one third of a second, I think the time was. How do you like the name of the place as you see at the beginning of the letter? I have not given the dugout a name yet. I would like to call it Hilltop but as it is not anywhere a hill, I can’t very well, anyhow will try and find a name in some magazine tonight. Have not heard from George lately. I am sending him a PC tonight, though he has not answered my last three. I get my mail very regularly here, your 31st letter reached me a few days ago. I am so glad you got the Melbourne photos, don’t forget to let the Stammers have one. Doris writes to me very often, poor girl seems to be having a bad time with her arm. Tell the girls that I received their letters and will answer them when I get the time, but of course this is meant for all. Shake Ted up about some photos, will you Mother. He must be a very poor photographer if he can’t get the house, tell him that. I want them to decorate my dugout with, I could get some fine snaps here if I had a camera but the penalty is death if one is found in your possession. Well Mother I will not say anymore this time, but will write again if spared. This article was written by Maria Griffiths. It was first published in Eagle Eye: Cowra Family History Group Journal, Vol. 32, No. 2, November 2014, pp. 24-25. Corporal Luke Hughes is commemorated on the honour rolls at Penrith Superior Public School, St Nicholas Catholic Church Penrith and at Memory Park in Penrith. His memory is also honoured on panel 27 of the Ypres (Menin Gate) Memorial in Belgium and on panel number 139 on the Roll of Honour at the Australian War Memorial in Canberra. This entry was posted on July 21st, 2015.